I don’t want this post to sound like a commercial. I want to share real details about my experience. If you’ve been following me for awhile than you know I keep things real. 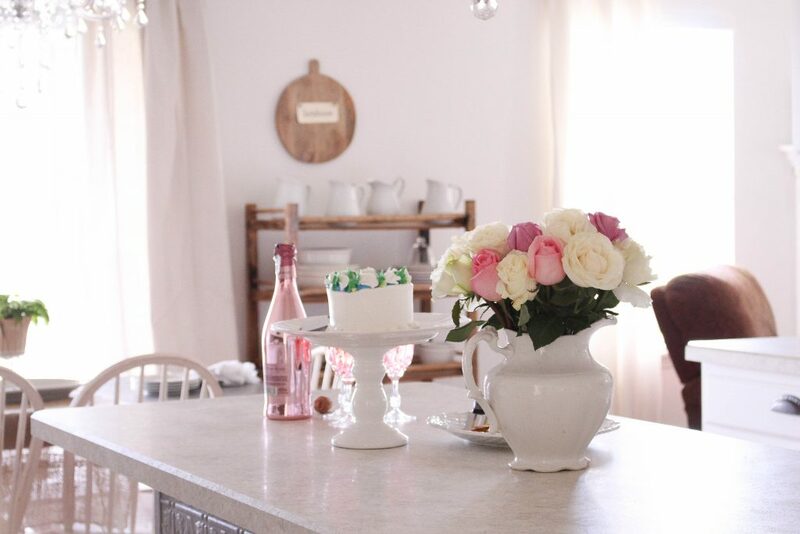 If this wasn’t a sponsored post I’d still share all of the details about my kitchen. I just want to you to know that I truly love my new counters from Wilsonart. 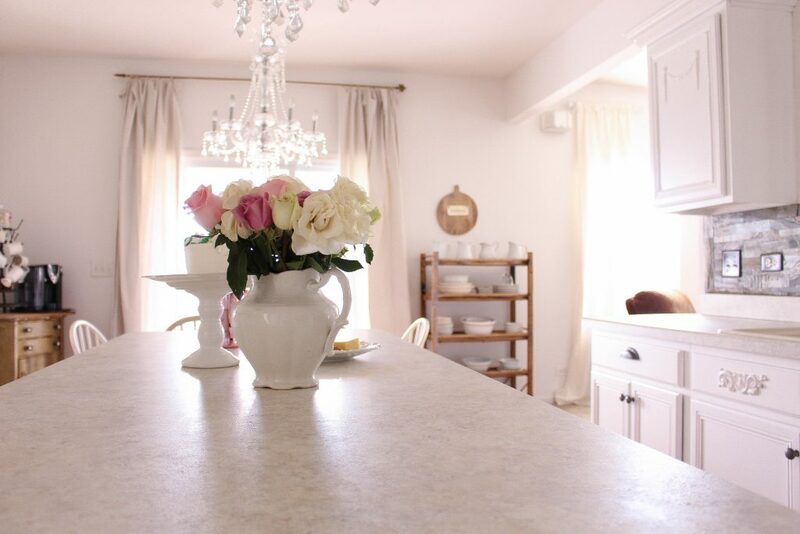 So before I start talking about how to choose laminate counters let me share a little more about my counters. 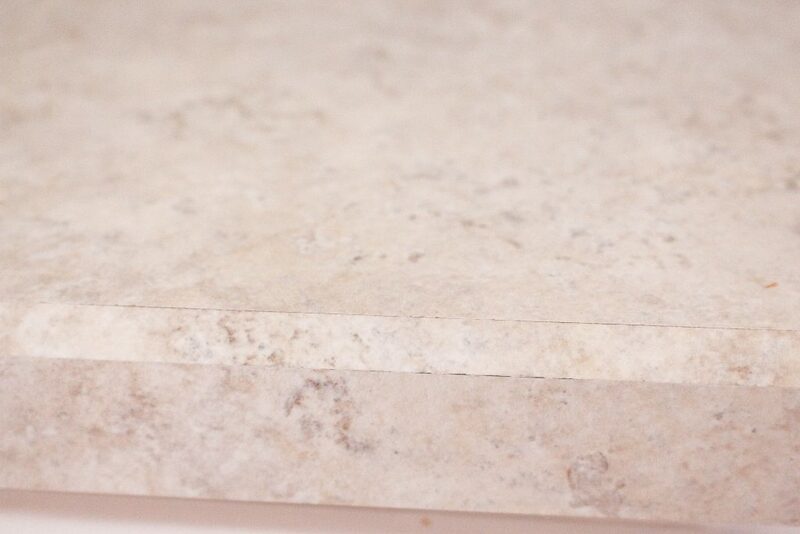 The laminate counters I chose are the Wilsonart HD laminate in Perla Piazza. It’s made to look like a stone. With Wilsonart HD technology it really looks and feels like a stone. It’s not cold like a stone but it has texture as a stone would. Wilsonart HD laminate has antimicrobial protection and enhanced scratch & scuff-resistant AEON™ Technology. It’s five times more durable and 3 times more wear resistant than industry standard laminate. In fact my fabricator told me that they sell more Wilsonart HD laminate that any other counter surface. I was actually surprised to hear this! I thought more people would choose a real stone. When I was choosing swatches to match up my kitchen it wasn’t easy. They have an amazing selection to choose from. I actually changed my mind a few times because my heart was set on a few but after thinking about it I knew that the Perla Piazza had the perfect colors for my kitchen. Every time I walk into my kitchen I can’t believe how beautiful these counters look. They look like real stone and very expensive but they are much less expensive than real stone like marble or granite. Wilsonart does offer quartz but I really wanted laminate counters. As you keep reading I’ll explain why I choose laminate. Deciding to choose laminate counters or stone was easy for us. I really love the look of stone but I knew that it was not in our budget and we plan on selling with in the next couple of years. I don’t think the investment would be worth the return value in our current home. That’s something you have to decide in your home. What the home value is for what you’re putting into it. I do know that kitchens sell homes so updating my counters was a must. 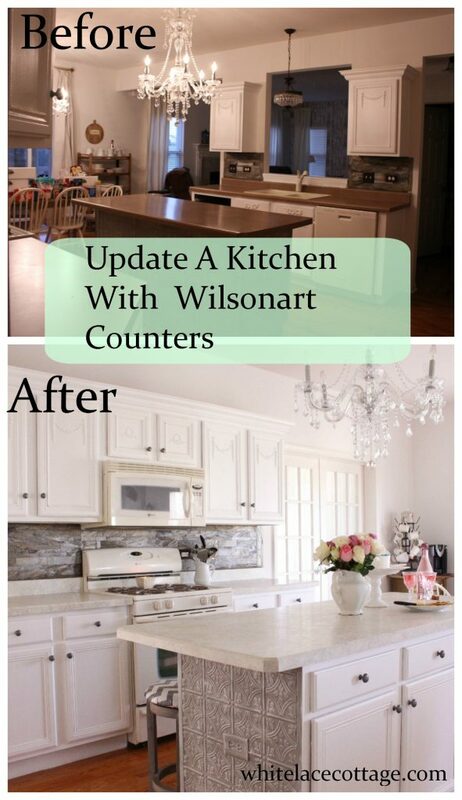 I started doing a little on line searching for counters and I came across Wilsonart. I was immediately struck by the selection that Wilsonart offers. They do offer Quartz counters but I was really interested in the laminate selection. Your counters will be the star attraction of your kitchen so choose wisely. Here’s a guide to use when you are deciding on which style and color to choose. 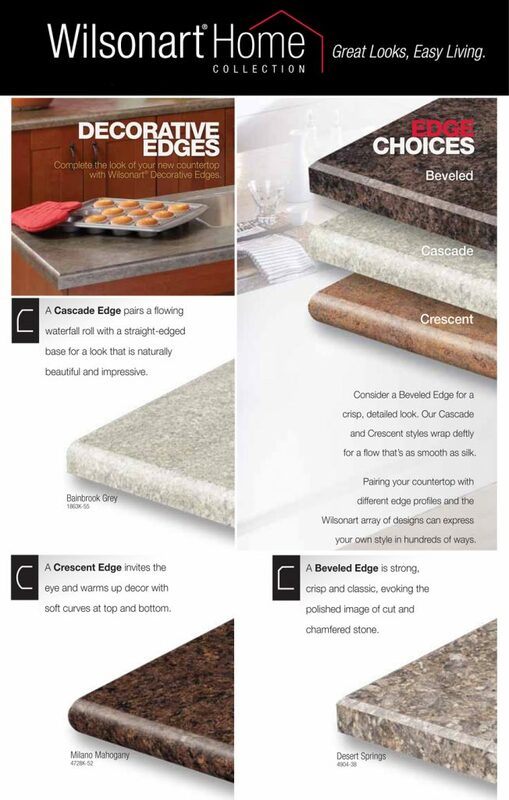 When you’re choosing your counters you must take several things in consideration. The first let’s talk about the color or stain of your cabinets. If your cabinets are a warm tone choosing a cool color such as a grey laminate counter isn’t going to work. 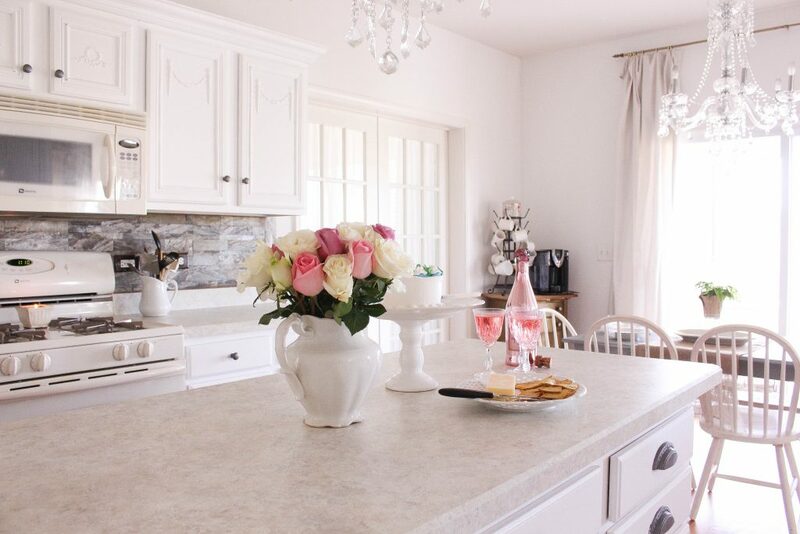 You want to make sure you stay with the same tone for your counters to match your cabinets. Your counters should also be complimentary to your backsplash. The two should not fight one another. What I mean is that if your backsplash is busy with different colors choose a counter that is softer and not as busy. If they both have a busy design it will be too much on the eye. If you have a backsplash that’s all one color you can choose a color that’s lighter or a little darker than your backsplash. But it’s better not to match it up exactly. 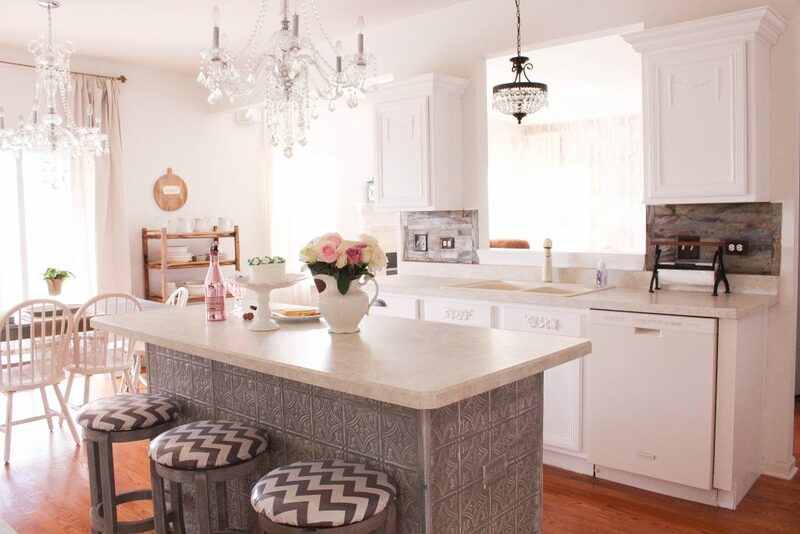 Even if your backsplash is white you should choose a design that has white but it’s not all white. I think it’s good to break it up a bit to give it more interest. Also think about your wall color. I know that a wall color can be changed. But you still need to keep your counters, cabinets and wall color and appliances all in the same tone. When I received my swatches ( you can pick up Wilsonart swatches at Homedepot, Lowes and Menards) I held them up to my cabinets, walls and next to my sink and stove. Since my counters are next to all of these they needed to work with the colors I had. Here’s where it gets interesting. My walls are a white color with a tad of grey. My cabinets are white and my appliances are a yellow white. I think the color on my sink and appliances are called bisque. The counters color that I chose, Perla Piazza, matches perfectly as it has all of those colors in the counters. As you would with a paint swatch make sure to look at the swatches in your kitchen in different light to make sure you have the correct tone. This is a big decision you don’t want to choose the wrong color. But don’t stress. My advice is to take your time choosing your color. This decision wasn’t hard at all. I wanted a different edge than I currently had which was the crescent. The cascade was another choice but I wanted something with a little more detail so I chose the beveled edge which is one of more popular edges I had no idea! This is where you’ll have to visualize what your counters will look like with a different edge. You may even want to keep what you have. But I wanted something a little different. 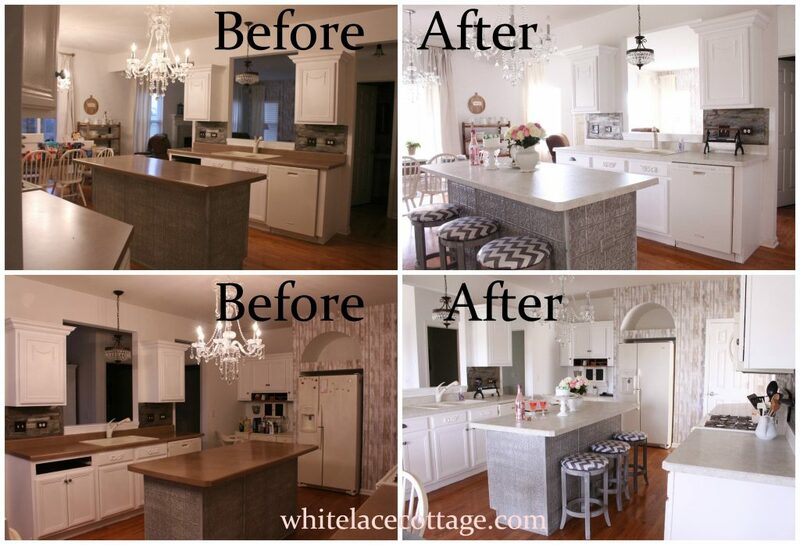 Let’s take a look at what my kitchen counters looked like before and after the transformation. It’s pretty amazing isn’t it. My room looks more pulled together now with my new laminate counters from Wilsonart. I can’t believe that these aren’t real stone! Every time me or my husband walk into our kitchen we have to touch the counters because they look like real stone! I’m absolutely thrilled with my kitchen! 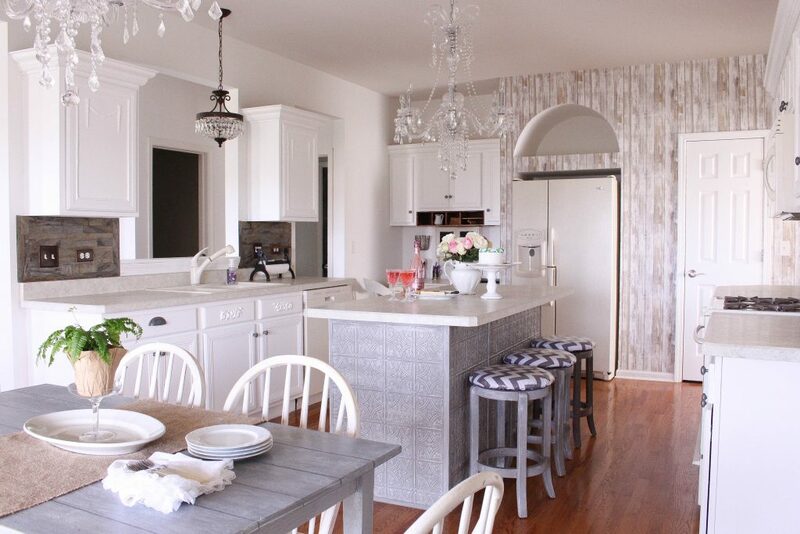 Are you planning on updating your kitchen? If you are what plans do you have? Thank you to Wilsonart for my beautiful new counters. Also wanted to thank Pierce Laminated Products Inc. They were a pleasure to work with. Very professional they did a beautiful job! I also wanted to thank Hansen heating, plumbing, air conditioning. I called them at the last minute. They arrived when I needed them and did a great job removing and installing my sink. I’d highly recommend both for anyone that’s in my area. Your counters are gorgeous! Love how much they look like real stone. My counters were put in when the previous owners built the house about 20 years ago and they’re really not in bad shape, just dated and not realistic looking AT ALL. Love the choice you made! What is your kitchen Floor? Is it hardwood of a man made product? Your kitchen looks terrific. Love your decor style. Beautiful kitchen. You have an eye for it Girl! You’re Awesome! Love to folow your emails etc. Your kitchen has gone through changes, but it looks so good. I don’t blame you I would stay in there, I know it makes you not want to mess it up.